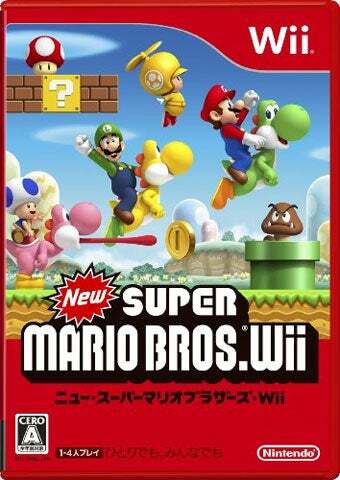 Nintendo released New Super Mario Bros. Wii in Japan last week, giving the console its biggest first-week software sales in the country to date, more than 950,000 copies sold, according to Media Create. That puts it ahead of Super Smash Bros. Brawl, ahead of Mario Kart Wii, and ahead of everything else released in Japan this week. While two new PSP games—Phantasy Star Portable 2 and Mobile Suit Gundam: Gundam vs. Gundam Next Plus—scored second and third place with impressive numbers, their sales couldn't come close to the newest of New Super Mario Bros.
And speaking of New Super Mario Bros., the Nintendo DS original is still represented well on this week's chart, managing to score 24th place this week, many years after its initial debut. As for the new games, Assassin's Creed II managed a top ten showing, as did PokePark for the Wii. In danger of slipping from Media Create's top thirty is poor old Dragon Quest IX. Hang in there, DQ!